Digibury is the meet-up event for digital types in Canterbury! They meet up on Wednesday 2.0 (the second Wednesday in the month – oh hai!) for talks, demos, messing about with digital stuff and drinks. Around 50 people show up every month and they have 2 or 3 speakers giving talks which are short, sweet and personal with plenty of time for questions and conversation. He’s going to talk about ‘ethical hacking’, ‘penetration testing’ and other exciting stuff in relation to hacking the mainframe, being a l33t h4x0r and his research on “the GIMP ScriptFu buffer overflow vulnerability.” Whatever that is when it’s at home. The speakers are going to talk about how they took advice from previous Digibury speakers and knocked out a geo-fencing game in a couple of afternoons. Daniel made a robot. 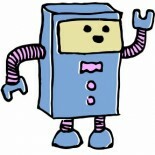 Keith developed the neural network which made the robot afraid of the colour blue. They’re coming to Digibury as part of their community service. – it starts at 7pm and finishes at 9ish. This entry was posted on 18/06/2012 by Creatabot in Creative and Art Events and tagged art, art zine, artist, Canterbury, creatabot, Creatabot zine, creatarbot, creatbot, createbot, creative, creative magazine, creative website, creative webzine, creative zine, creatorbot, Digibury, digital events, Gallery, help creatives, help for artists, indie, indie art, indie magazine, indie zine, Medway, online art magazine, online art magazine Kent, online art magazine UK, online creative, online creative magazine, online magazine, promote artists, studio, support artists, support creatives, webzine, zine.